Connected wearables like smartwatches and fitness bands are good for tracking one’s physical activity and monitoring vitals like blood pressure, heart rate, etc. But when it comes to an actual medical utility like detecting symptoms of illnesses and playing a role in getting help in case of a medical emergency, they are not quite there yet thanks to technological and regulatory challenges. But there is one exception now. The US FDA has approved Embrace, a smart wearable capable of monitoring seizures in epilepsy patients and calling for help when the need arises. A device is not fully accepted as a dependable solution for medical professionals until it has passed a series of tests conducted by healthcare regulatory authorities such as the FDA in the US. Embrace crossed that hurdle becoming the first wearable device to get the US FDA’s approval as a certified medical device in the field of Neurology. We’re beyond excited to announce that the Embrace Watch has been cleared by the U.S. Food and Drug Administration as a medical device! This is a profound achievement for the epilepsy community at large. The IP67-rated Embrace smart wearable is the product of a crowdfunding campaign launched by a company named Empatica. After reaching its financial goal, the wearable device went on sale in 2015 but has only received its FDA approval as a medical utility device in January 2018. Embrace detects convulsive seizures that are common for epilepsy patients by reading the abrupt spike in neural and physical activity, and instantly triggers an alert which is sent to a caregiver. However, it can also be used for general purpose health monitoring and activity tracking, thanks to the plethora of sensors under the hood, some of which are also capable of detecting sleep patterns as well as stress levels, which can be physical, emotional, or cognitive. 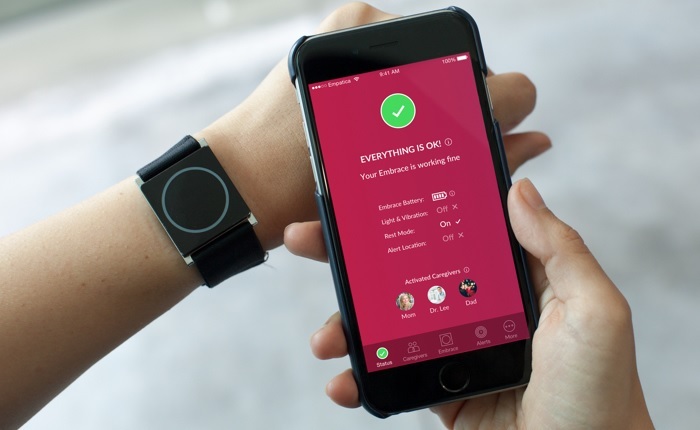 Embrace pairs with a companion app over Bluetooth with any Android/iOS smartphone, and automatically sends an SMS or makes an alert call to the patient’s caregiver whenever the smart wearable detects a seizure. Embrace costs $249 and can be purchased from Empatica’s online store.